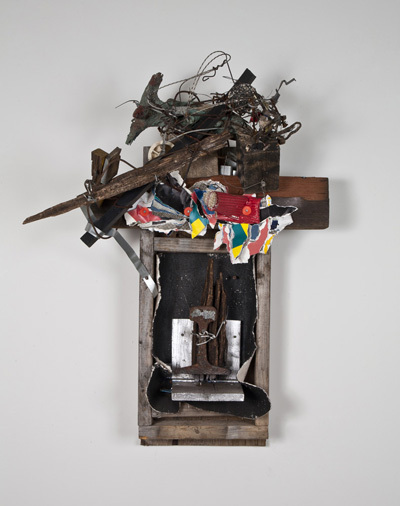 Lonnie Holley: Assemblages and Drawings. Holley, a self-taught artist, is a sixty year old native Alabamian whose work has been exhibited widely throughout the United States. This is Holley’s first solo exhibition with the gallery, and his first in New York in sixteen years. Holley’s unique combinations of found materials and everyday detritus result in mysterious and powerful objects. They reference spirituality, African American art forms and history, nature, and family relationships. Simultaneously, the visual impact of Holley’s work invites comparisons to the work of other contemporary artists, and therefore continues to break down the distinctions often made between self-taught artists and those with an art education background. Holley’s assemblages can be simple or complex in their composition. Along the Rails combines old wire, iron, wood, colored paper, cardboard, plastic and other materials. Assembled with both delicacy and verve, its title suggests a journey, escape or hardship. Molting Lonnie is composed of three parts: found concrete with a rebar that serves as the vertical support for a piece of molten iron. The top of the concrete base is splashed with red paint, dripping down the sides. The materials and their deft organization evoke a raw and formal beauty, while the title of the work suggests impending growth, a recurring theme in Holley’s art. Featured prominently in Holley’s work is a facial profile, found in drawings, wire sculptures and carved sandstone pieces. Small or large, single or in layers, the profiles have open and expressive eyes. In the drawing I in the Teacher’s Chair, profiles face left and right, while one large eye dominates the center. A kneeling figure cradles a child, watched from above. It is a family or community of sorts, observing and caring for one another. These faces and figures function as characters in an ongoing story. Indeed, Holley’s vivid descriptions of his art stress the interconnectedness of all people and things, both past and present. Lonnie Holley was born in Birmingham, Alabama, and is the seventh of twenty-seven children. Against significant obstacles he has been a working artist for over thirty years. In Birmingham, he created a unique outdoor installation of his art on the acre of property where he lived, until a forced relocation seventeen years later. Holley lives and works in Harpersville, Alabama. Holley’s work is included in numerous public collections: American Folk Art Museum, New York; Birmingham Museum of Art, Alabama; High Museum of Art, Atlanta; Milwaukee Museum of Art, Wisconsin; Museum of Fine Arts, Houston; New Orleans Museum of Art, Louisiana; Philadelphia Museum of Art, Pennsylvania; Smithsonian American Art Museum, Washington, D.C., among others.